What are the common hair problems and their solution? Our crowning glory, our mane is definitely the most prized possession. Like every asset, it too is a liability; in the sense that you have to take care of it, maintain it. Even then we have to deal with a host of problems. Not venturing into the clinical side, I am listing a few of the commonest of the hair ailments. Hairfall: The COMMONEST hair problem which almost everyone faces every now and then. Although one should be familiar with the fact that it's absolutely natural to lose 50-100 strands everyday. The hair cycle has three stages: catagen, anagen and telogen. Those in the telogen phase fall out as they have gone old. Split ends or Trichoptilosis: This results when the hair cortex (the outer most layer is weak) and results in fraying of hair from dryness. Premature graying of hair: This problem is on an alarming rise nowadays. Believe me, as a clinician, most of my younger lot of patients come to me with this problem. Wrong lifestyle habits coupled with faulty nutrition and genetics causes this problem. Nowadays even people in late twenties are resorting to dyeing their hair. Alopecia: The most extreme cases of hair fall result in this ailment. Alopecia means baldness. However there are two types: Alopecia areata and Alopecia totalis. Basically alopey is an auto immune disease. That means the body's own antibodies attack the hair follicles from which hair grows. As a result, there may arise patchy baldness: Alopecia areata or total loss of hair: Alopecia totalis. Dandruff: Scientifically, this is called Seborrheic dermatitis. This is even commoner than hair fall. Often dandruff is the first cause of hair fall. It's basically a fungal infection that needs to be gotten rid of. Now all the above conditions need medical treatment which need time. What can be the solution cosmetically and that too instantly? Hair wigs! I just came across this wonderful website Everydaywigs.com. They have a wide variety of wigs that can be suited to your style and needs. Ombre Wigs: These have a natural hairline and has heavy density. Made of heat resistant kanekelon silk, it is restylable under 180° The cap is of average size with lace front and wefted back. 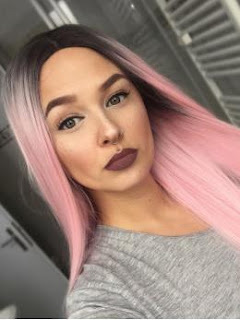 Pink Lace Front wigs: Pink is a lovely colour when it comes to sporting a unique hairstyle. These have a natural hairline and has heavy density. Made of heat resistant kanekelon silk, it is restylable under 180° The cap is of average size with lace front and wefted back. Blonde Lace Front Wigs : This is the most popular style. Every girl dreams of being a blonde at one point or other. They have different styles like silky straight or wavy. The hair density is 150% which is heavy and have a natural hairline. These all are Quality synthetic Wigs that give an excellent natural look. So if you are fighting any disease, this is the simplest solution. Also if you simply want a change of hairstyle, this is a very easy /safe method. Like I don't have the courage to chop my hair short as my curly hair needs a long time to 'grow' long. But every now and then I feel like sporting a Bob. This is the best way to do so! Gaming Vegas: A heaven for kids! How can proper nutrition solve hair problems? What is Hydra Facial and why is it so popular?